A profile of SO-IL, the lean, mean firm behind the P.S.1 courtyard installation, this summer’s hottest architecture project. 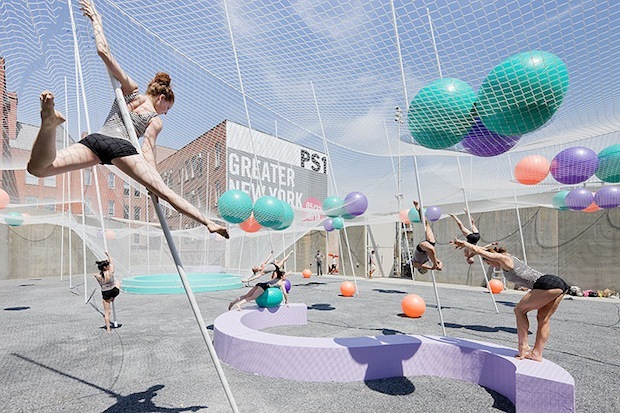 Pole Dance, a giant installation in the courtyard of MoMA P.S. 1 in Queens opens this weekend, June 27, and the following weekend, it’ll become the splashy backdrop for the museum’s legendary series of open-air dance parties. For the firm that desgined it, SO-IL, it presents a shot at the big time–an attention grabbing stage for a tiny firm that operates lean and mean. Jing Liu and her husband Florian Idenburg started SO-IL (short for Solid Objectives Idenburg Liu) in 2008. That might have been the worst time the last 50 years to start an avant-garde architecture studio. But never knowing cushier times has been an odd blessing. The couple works out of a small, sunny studio in Dumbo, Brooklyn, with three full-time staff and a few interns. With a fixed budget of $85,000, the P.S.1 project creates maximum drama at minimum cost. 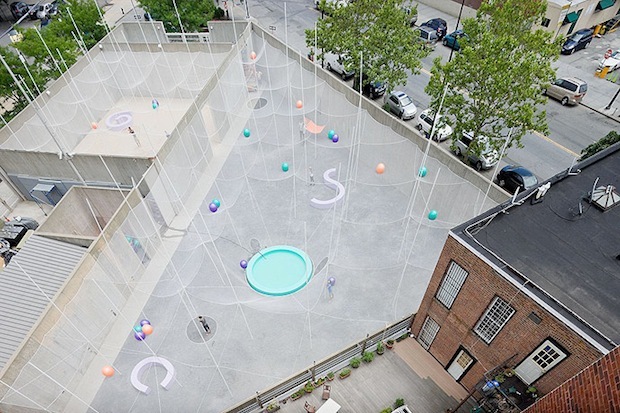 The installation is composed of a giant net, supported by a 16×16 grid of 30-foot metal poles that are connected again with bungee cords. The net holds dozens more oversized yoga balls, and the poles themselves bob and sway, causing the balls roll around and the net to ripple and change shape. Below, for lounging, there’s hammocks and pulls that tug on the poles, and a system of misters to keep people cool and rain-collecting plants that gather up run-off water. “If they want to innovate, architects need to take more responsibility for budget and scope,” says Idenburg of his profession. The materials were sourced from the Internet–and specifically, Alibaba.com, a business-to-business trading site that covers 240 countries and works like a Match.com for manufacturers. And after the installation is done, the parts will be reused: A tourist from Jamaica who was visiting the museum already has dibs on the massive net. She’ll used it to catch the papayas dropping from trees in the garden of the hotel she owns. The yoga balls that glide along the top of the net will be distributed to workers who helped build the project, and the anchors for the poles might return to their intended function of supporting windsurfing masts. SO-IL has another big upcoming project for Kukje Gallery in Seoul, Korea, which will open in the fall of 2011 and showcases just as much ingenuity–it, too, should grab attention with a shimmering, shape-shifting design. The entire new gallery will be wrapped in a stainless steel chain-link mesh, similar to the New Museum in New York, which Idenburg had worked on as a staffer for the Tokyo-based firm SANAA. Unlike the New Museum, the mesh around Kukje Gallery will be flexible. Think chain mail worn by medieval knights: The building’s surface will undulate in the wind and change in the light. Where do you get oversized chain mail for a 2,000-square-foot building? The search set Idenburg and Liu on a globe-scouring search which started, once again, at Alibaba. “We took an intentionally naïve approach,” says Liu, of the decision to float their product specs to Alibaba’s global network of manufacturers. After putting out the call, they got back about 100 responses. Liu recollects, “About 90 said ‘not possible.’ But 10—maybe equally naïve companies—said they could do it.” Two of these companies sent SO-IL viable samples. A chain-link covered model of the Kukje Gallery in SO-IL’s office gives an idea of the building’s final form: a cloud with endless silver linings. The image aptly represents SO-IL’s history to date. While they’ve found success in a down economy, they’ve been both adept and lucky at converting disappointments into opportunities. A house they designed for legendary graphic designer Ivan Chermayeff was put on hold during the recession, but with Chermayeff’s blessing SO-IL posted the video they made about the project on Vimeo; someone saw it and is now talking to SO-IL about designing a similar residence. The firm entered a competition to design student housing in Greece and lost, but a potential client saw their entry and liked the concept so much that SO-IL has been commissioned to design a bigger version of their idea across the street from the original site in Athens. “Getting new work is a bit like a tumbleweed,” says Idenburg, “You’re not exactly sure where you’re going but you pick up things along the way.” But the firm can now be more selective in its work than the tumbleweed metaphor might suggest. Combine that with a talent for resourcefulness, and the result is a small firm that operates like a global one.